The scarf is off the needles and sometime this weekend I'll block it. Fingers crossed that it softens up, I have a feeling it will. Do you see that bit of sparkle? Beads!! They are strategically placed at the edges while binding off. It was fun placing them and now I have a burning desire to bead more knits. It was gloomy and dreary yesterday so much so that I felt sad. I tend to not be influenced by daylight shortening in the fall and winter, maybe because I am thrilled there's a chance of snow. I eagerly await the short days and snuggle in after dinner with knitting and tea. I briefly miss the after dinner walks but just barely, I have a love/hate relationship with exercise. Come spring and yes it is spring here, I am a sponge to the returning sunny days, blue skies and mild breezes that herald in the beginning of nature's growth. Thursday was sunny so much so that I sat outside, closed my eyes and absorbed the beauty. It was wonderful-even Frodo joined me! So that brings me back to yesterday, I was feeling sad, I kept looking at the clouds and wondering why I was miserable all because of the weather. Standing there, questioning the sky I decided to look down. With the clouds and the drizzle I found the wild violets that sprinkle our hill ready to bloom. Spots of purple were peaking out amid the grass and weeds. Wow, your scarf looks great. The little beads are a nice touch. Sometimes we just need to shift our focus from what is making us sad at that moment....how lovely that yours was just at your feet. Sweet, sweet violets. Have a great weekend...fingers crossed for a bit of sun and warmth! Beads....oh dear! I'm afraid if I learned how to do that, there would be beads on EVERYTHING. I'm usually not too affected by the weather ether, but every once in a while it does get to me. My happy moment was the birds building a nest in our gas grill....it has no gas at the moments, so it's all good. I'm going to try to get a picture because I think there might be babies soon :) Have a lovely weekend!! I am with you- sun sponge! Have a great weekend. i love the beads at the end. what a great little splash of bling! and i so get you, when spring and summer are here i am just done with cloudy days, i want to soak up sun sun sun! here is to many many sunny days ahead! Such a pretty scarf, and I though Sweet Violets was its name from the post title. Quite appropriate given the color. Have a good weekend! I love the beads - looking forward to seeing it blocked. It always amazes me how the weather changes everything. And little things like flowers starting to peek out. :) I'm in my yearly "perk up" time too and am so glad. So glad you cheered up! Happy blocking this weekend, I love the colour of your scarf and I do hope it cheers you. I love violets too, such delicate, sweet little things. 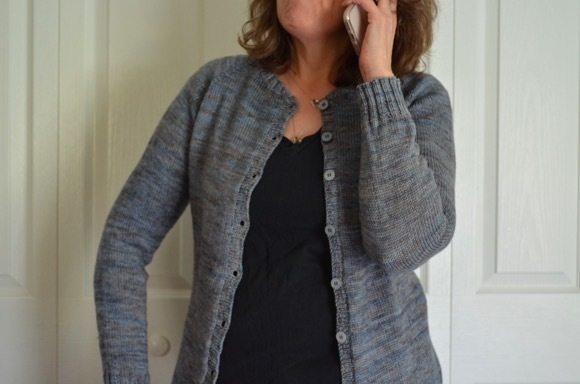 Thanks for your sweet comment about my cardigan, hehe I'm delighted to lengthen your queue!! that is so sweet karen, glad for those lovely violets. 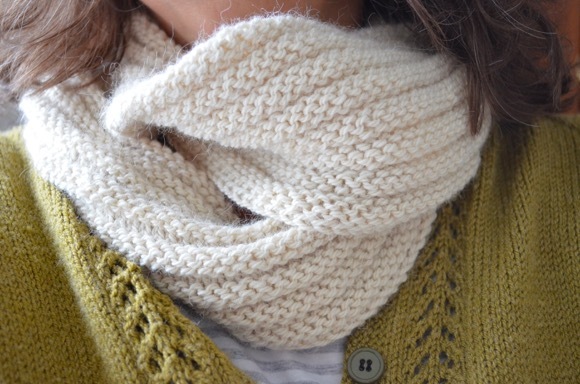 i have never knit with linen and am looking forward to seeing how it softens for you. beautiful color for spring! I am always affected by the weather and am glad to hear you are feeling happier. I love your beads, where they hard to do? I have that on my to learn list. I hope you are enjoying a lovely weekend. I am sadly influenced by dull, grey days as well. Just what we are having here now - as more snow falls. Love those sunny days of clothes on the line and picnics in the yard. Thanks for reminding me there is beauty in it all! I'm glad you're felling happy now. It's amazing how nature can calm and brighten our mood. clever you beading as you knit...I don't think I've ever tried that but it's another project I'm looking forward to seeing it. It matches your violets beautifully. I love deep shades of indigo and violet in your scarf. I have never knit with linen before, so it will be interesting to hear how much it softens as you go through finishing. I live for longer days... anything but winter. The time between winter solstice and spring equinox is always a challenge for me, although I've learned to appreciate the beauty of the monotone landscape and quiet before the rush that happens as temperatures climb. I'm late to the comment box, but hope you are still feeling bright and happy.